Based on the above quote the “Alberti window” is frequently used as a metaphor to describe the sense of immediacy, and for some immersion, that users experience in especially virtual reality and virtual worlds as it points to the idea that it is possible – at least in a psychological sense – to “step through” the window and enter the space depicted. Here I’ve taken the quote from Bolter & Grusin’s book “Remediation – Understanding New Media” p. 24-25. As part of my research on remediation I’ve spent the last couple of days studying their book in detail and this post will be the first in a series of trying to make sense of my notes combined with my experience in and examples from SL. 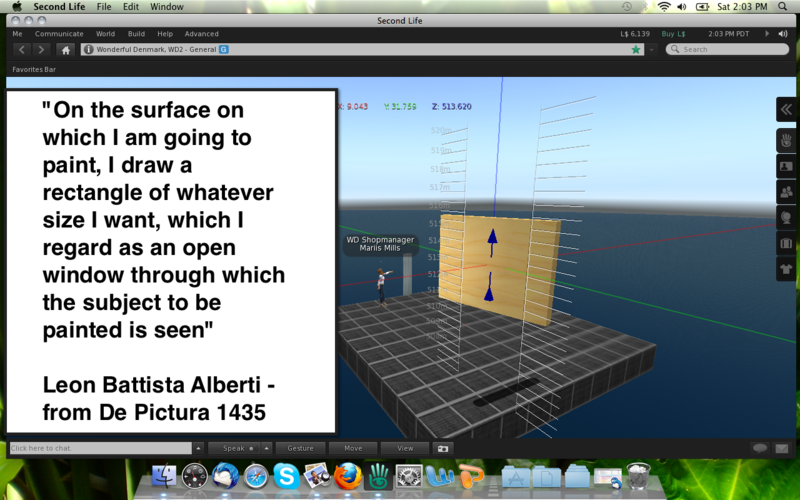 But before getting to the point I wanted to make about Alberti’s window and the new shared media function in SL, let me just make some quick remarks on some of the key concepts in the book. Defined by Paul Levenson as the “anthropotropic” process by which new media technologies improve upon or remedy prior technologies. We define the term differently, using it to mean the formal logic by which new media refashion prior media forms. In short the SL Shared Media (SLSM) allows a wide range of web pages, including Flash and YouTube videos to be displayed on any surface of any prim (building block), among which some also allow for real time collaboration such as my student PerSecond and I previously demonstrated with Google docs and Etherpad. Now, in my context of Distance Education this new function offers many interesting possibilities. A major argument for me as a distance educator to research SL stems from this particular media’s ability to provide the user with a sense of being embodied in a palpable place – mainly in opposition to conventional teaching and learning platforms, where the user typically finds himself disembodied in impalpable space. In the pictures below I’m represented as my avatar standing on my holodeck looking at a shared media prim displaying Facebook. This statement: “Television incorporating social media like Twitter streams or text-message polls via cellular phones in live shows to enhance interactivity.” reminded me that TIVO originally was envisioned itself doing this before it became a consumer product. Some even predicted it would be used to replace voting & that (which I believe can now happen with Dominoes pizza) you could order groceries through your TV. (Talk about couch potatoes!). My point is most of these ideas were passed aside. I think we are only on the cusp of these phenomena you discuss & a new innovation will incorporate all of them in ways we can’t imagine yet plus second & third order effects. I couldn’t find examples but this also reminded me of those paintings/photos of infinite perspective where the artist shows a painting of a painting within the painting, ad infinitum ( though technically that is done through only the medium of photography/painting). My head is spinning, Mariis. Wonderful post and such an interesting riff on Alberti and the concept of “windows”. I too have been completely taken by the power of the new SLSM function and what it hints at for the path ahead in education. To see (and interact with!) something recognizable/familar from the real world in the virtual world makes it so much more authentic – a huge qualitative lift. And when you add into the mix, the concept of multiple windows, nested windows, multiple images do we get hyperhypermediacy?